I debated whether I should title this post part 2 in the demi-couture series (such as it is…which is coming along slowly!) or if I should kick off a new ‘embellishment’ theme. Demi-couture would normally be understood to involve a lot of handiwork in the garment construction, not just the embellishment of the final piece. Miuccia Prada’s designs are not usually complex or unusual or intricate cutting jobs, but it is all the different elements she brings to play in one final garment; it could be a dramatic cuff, an asymmetrical hem and a bejewelled collar; it’s the totality of the garment. So I don’t know from one design to the next how much of a hand – in the literal sense – there is in the garment construction. 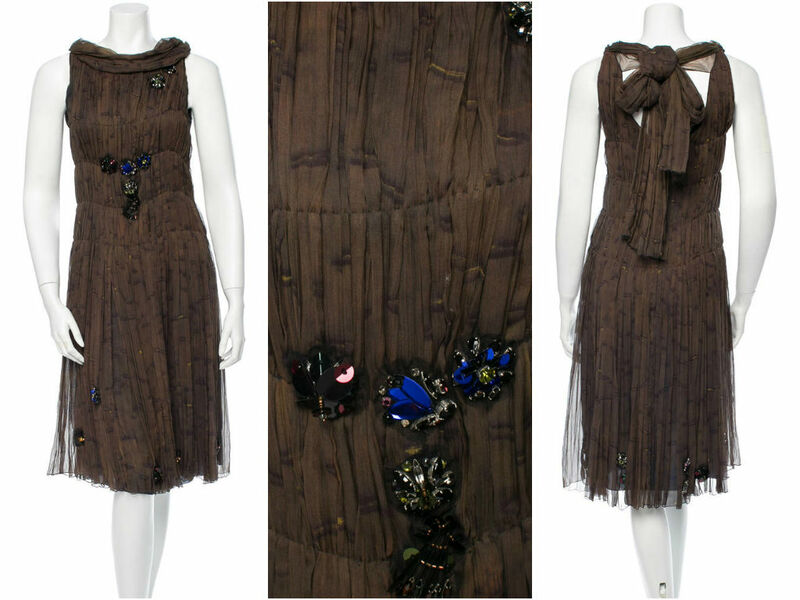 But I’m very comfortable to assert her embellishment is fantastical and modern. Where the French , through Lesage and others, will produce glorious embellishment in the classic tradition, Ms Prada conjures these insouciant mash-ups and adds them “just so” to her clothes. And I’ve been completely fascinated in all these flourishes and twists of hers. If I couldn’t think of anything else to sew ever again, I could be kept busy doing Prada reproductions. The two coats above would be a starting point. I do have the fabric for both of these! 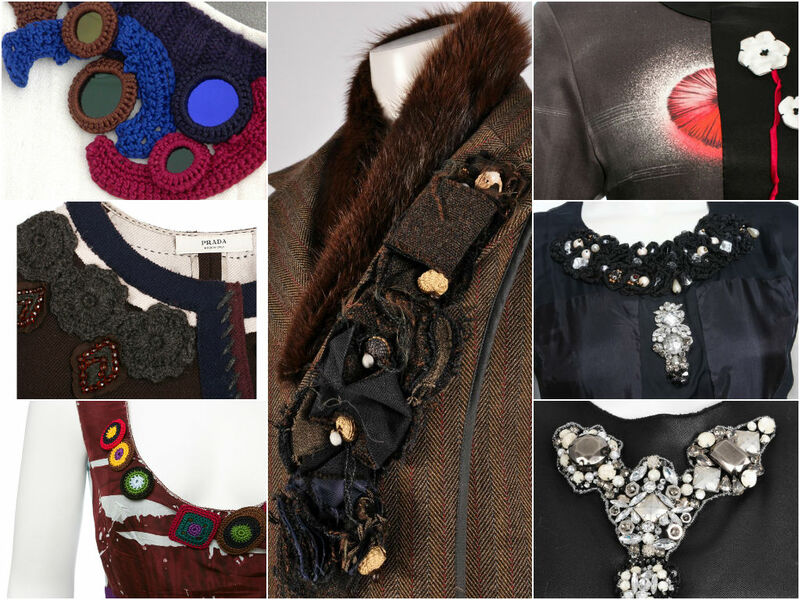 So here is just a small gallery of some of Ms Prada’s work, spanning over many years. 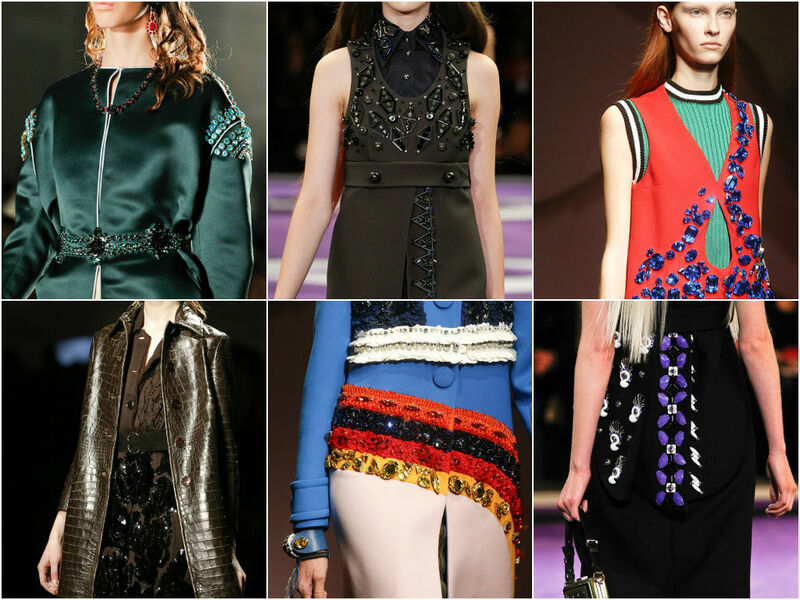 The high point of her embellishment must surely have been these pieces. If you look carefully, you will see that these beads and findings are the regular ones you will find in your local supplier, just assembled to form larger motifs. 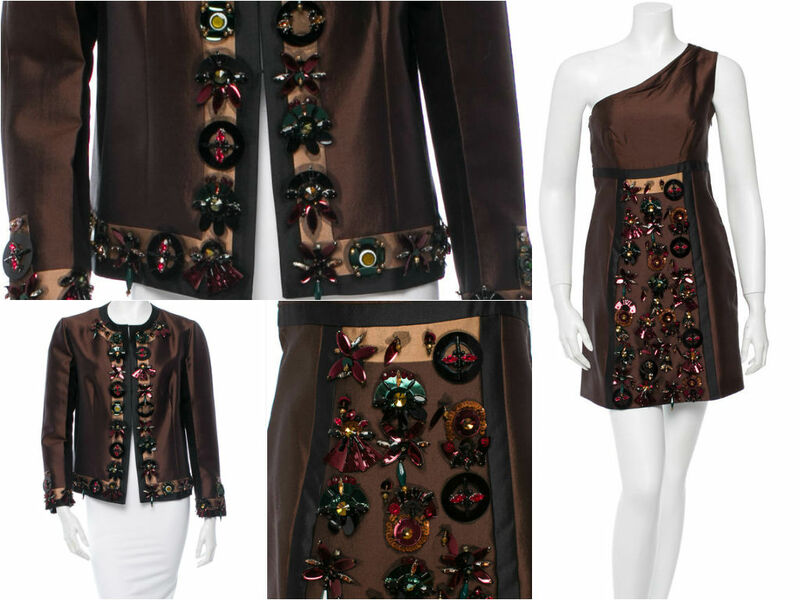 These thumbnails show that Prada’s shapes were often quite simple but the garment elevated through embellishment. Here crochet, including crocheted mirrors in the Indian tradition, applique and beading are all used. These dresses are definitely pre-Pinterest pictures, torn from magazines over the years. There are such clever details in so many of the dresses. This is one dress I still dream about replicating. There is so much pick-stitching in this one! 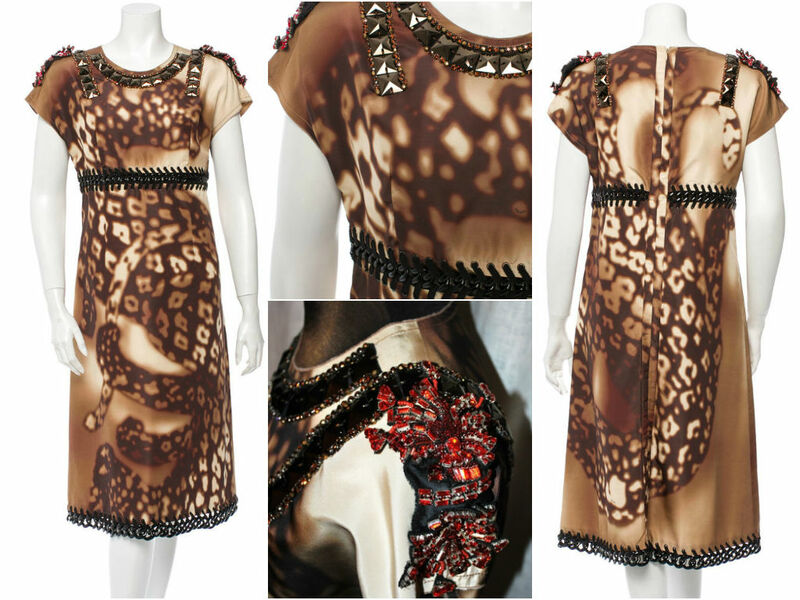 I could have included the following dress in the ‘Prada and the grommets’ post. This dress is a mini masterpiece, like it or not, it is a masterpiece. 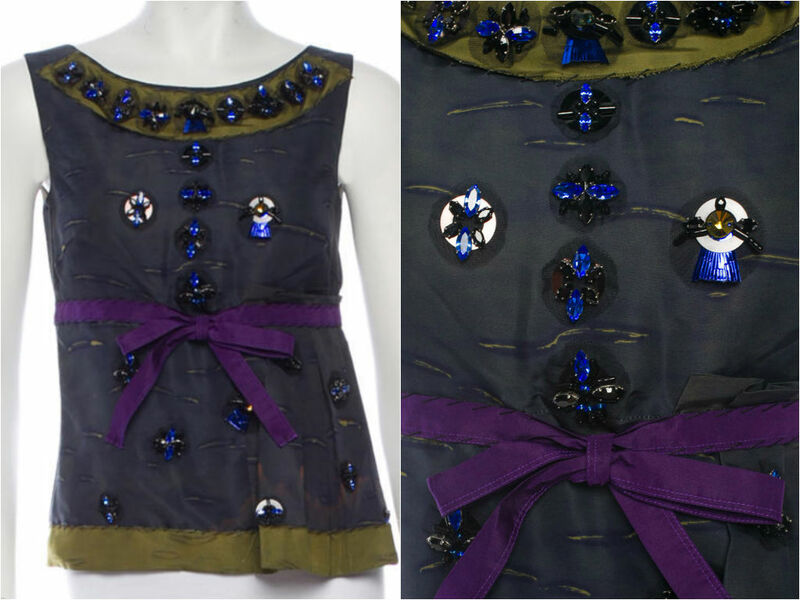 First the digital print, then, rows of rivets are made to join the yoke and the midriff together; and then another row in the hem to hold the embellishment. The garment pieces are then threaded together using the rivets. And then the black embellishment is continued through the bodice. 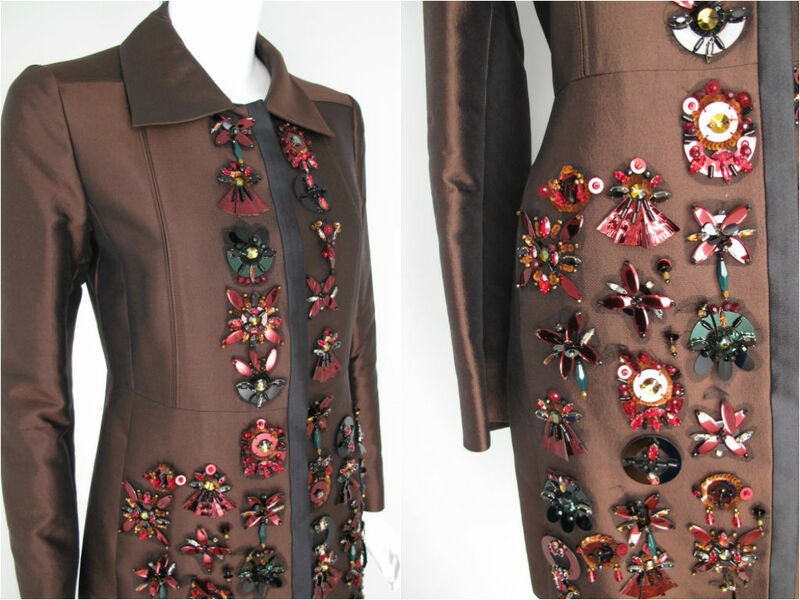 Last dress, and yet another example of Prada’s love of the ornate touches. I could have done another 20…40…50 collages to show off the work over the years. Outwear, tailored clothes, separates are all under-represented here but equally worthy of showcase. Prada’s is one of the best archives you could ever hope to go poring over; ideas endlessly tumble over each other. It is no wonder she is so lauded.